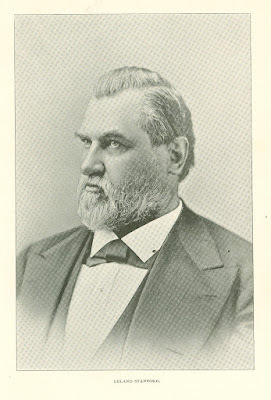 In estimating the value of the public services of Leland Stanford, we must remember that at the time of the orga­nization of the Central Pacific Company our State was twenty-three days from New York for travel by way of Panama, and for freight four months by way of Cape Horn; and that the construction of a railway across the continent was in­dispensable to the proper development of the industries of California. The prospect of the iron road was constantly before the public mind and its import­ance was universally admitted, and. yet the leading merchants and all the millionaires of San Francisco failed to devise a feasible plan of construction, or to organize a company on a substan­tial basis. Many that declared them­selves in favor of the project on general principles also said in confidential con­versation that there were insuperable difficulties in each of the three main branches of the project, the legal, the pecuniary, and the engineering; and that the great work must therefore be left to a later time, and perhaps to a later generation. And this opinion was accepted by most of the wealthy men in other parts of the State as well as in San Francisco. Thus the little association in Sacra­mento had the field to themselves. No other company competed with them for the right of way; nobody wanted their stock as an investment. Among the capitalists of San Francisco Samuel Brannan distinguished himself by sub­scribing for a few shares, because he thought the enterprise should be en­couraged on general principles. There were sympathetic people who expressed regret that the Central Pacific people should waste their money and time in making surveys, preparing bills, col­lecting information, sending agents to Washington, and obtaining a recognized position in the State and Federal coun­cils. But these surveys were not made, these bills were not prepared, these of­fers and claims of their company were not presented in different departments of the government, until the directors of the company had seen that success was possible. By studying the subject carefully they learned the precise na­ture of the obstacles before them, and they saw how these obstacles might be surmounted. They prepared themselves for different contingencies which other persons had not anticipated, and when the contingencies arrived they acted promptly and judiciously. The result was that these five men, who together, a few years before, had not credit for a million dollars, found themselves con­trolling one of the greatest railway sys­tems of the world, and controlling it with consummate ability. Without counting what they did farther east, they built 4,500 miles of road west of Ogden and EI Paso, thus creating a large part of the wealth of California, Oregon, Nevada, Utah, Arizona, and New Mexico. The government enriched them, and was abundantly repaid by development of national resources, and the unification of national interests. The locomotive, as Mr. Stanford often said, is a great civilizer. It creates trade, stimulates agriculture and man­ufactures, increases the value of land, attracts people, builds cities, and develops all material resources. It is also an important factor in polity. In a very extensive country like ours, it is the most secure bond of political union be­tween the East and the West. And it is in a region like that part of our coun­try west of the Rocky Mountains, where the rivers are small and few, and the mountains high and numerous, that the iron track is particularly beneficial. Mr. Stanford had a right to be proud of the benefit which his roads had con­ferred on California and the adjacent States. He had a rare talent for organization. He knew how to select and govern men. He wanted the best engineer to take charge of his road building, the best lawyer to conduct his lawsuits, the best road superintendents to manage his different divisions, and so on through all departments. He gave them author­ity, paid them well, and made them responsible for results. He gave them every inducement and every opportu­nity to do good work. His career indi­cates that he adopted the rule that, whenever circumstances permitted, his work should be done with the highest obtainable technical still, after the most, careful study, and in the most durable manner. He wanted no temporary suc­cesses; he made few promises; he cared little for the hurrah of momentary ex­citement. It was his ambition to do creditable and solid work, and the more he did the more he wanted to do. When he sought franchises it was presumably in the belief that the public interest de­manded them, and in the intention of paying well for all he got. The solidity and sincerity of his character are shown in his work. Though many improvements have been made in cable traction since the California Street road was built, under his direction, that road has been the model for all the well built roads of later date. Many of its features were new, and its excellence as a whole is marvel­ous. His organizing talent was not limited to railroads, but achieved import­ ant results in many other directions. The idea of showing animal motion by successive instantaneous photographs originated with him, and the main credit for all the notable discoveries made by such illustrations belongs to him. His horse farm is the largest and most suc­cessful establishment in the world for breeding fast horses, and yet he did not bet on races. The same thoroughness which per­vaded the industrial enterprises of Mr. Stanford appears also in the University which, though named after the much la­mented son and only child, is really the monument as well of the parents, who combined their purposes and their fortunes in its foundations and organiza­tion. To his wife Mr. Stanford left a supervisory care during her life, with the privilege of completing its endowment. The decided merit of many original features in the plan of the University is ad­mitted; and the unequaled beauty of its quadrangle makes a great impression on every visitor. The daily press has accused the Cen­tral Pacific directors of using discredit­able means to obtain franchises and ju­dicial decisions, but these accusations have been grossly exaggerated in many points, have been actuated by partisan , malice in many cases, and have not been sustained in any material specification by a complete statement of evidence. The questions of fact and law involved in them are numerous and complicated, . and the time has not come for pronoun­cing final judgment; but the presump­tions indicate that Mr. Stanford did what he believed was best for the general welfare, and what other business men of equal ability and of good repute for integrity would have done under the same circumstances. Assertions have been made that the influences by which Mr. Stanford at­tained the national Senate were not entirely creditable to him, but in this matter there is no testimony save which cannot by verified, and which in some material points is evidently im­probable. Until conclusive proof is pro­duced, the presumption of reputation, and general conduct are entitled to pre­ponderance. As governor of California in 1862 and 1863, Mr. Stanford performed his official duties creditably. His administration was able and honest. There was no ru­mor that he was influenced corruptly in any of his official actions. He did not make a great reputation as a war gov­ernor, as did Morton in Indiana, and Curtin in Pennsylvania, and Andrews in Massachusetts; but he did not have their opportunities. His part was well done. As member of the United States Senate he did not distinguish himself. He did not enter that body until after he had passed the years of his greatest physical and mental activity. He had no preparatory familiarity with the de­tails of national legislation. He was not a skillful and indefatigable manager of committee work as were Gwin, Conness, and Sargent, the most efficient senators California has ever had; nor was he a brilliant orator like Newton Booth. And yet Mt. Stanford's extensive experience and sound judgment were valuable in the Senate, and his presence in it added to the dignity of the body. Mr. Stanford's reputation in social and commercial circles was exception­ally good. His intimate acquaintances regarded him as not only honest and truthful, but as remarkably considerate of the feelings of others. The senti­ment of philanthropy was an important part of his mental constitution. He took pleasure in doing good, a fact well known to many people who lament his death. So far as his neighbors and friends knew he had no weaknesses of character, no vanity, no fondness for ostentation, no delight in boisterous company, no fond­ness for amusement which might be in­nocent, and yet would take him away from his home. Club life had no attrac­tion for him. That he was secure in his social and pecuniary credit was a well known fact; and this knowledge saved him from personal mention in many cases where abuse was heaped on the Central and Southern Pacific com­panies. Looking over the list of those Califor­nians now deceased, who will probably have the most secure place in the mem­ory and gratitude of the residents of our State in a remote future, three names seem to me permanent. These are James W. Marshall, the discoverer of the gold of the Sierra Nevada; James Lick, the founder of the Lick Observatory and of various notable institutions in San Fran­cisco; and Leland Stanford, founder of the University at Palo Alto and the chief railroad builder of California. Originally published in the Overland Monthly Magazine. September 1893.